Tuning carburetors correctly takes time. When you put that kind of time, effort, and attention into something, isnt it worth making sure you are doing it right? While there are all kinds of things we can talk about as far as tuning carbs, for now we want to make sure you are using quality components. We strictly deal in Mikuni carburetors, and Mikuni components. Niche Cycle Supply does not carry any third party components, or knock off carbs. You can rest assured that if you get it from us, its a genuine Mikuni product. How can you tell if what you bought is genuine? Mikuni makes good stuff. If your holding it in your hand, and it looks like junk, suspicion should rise. 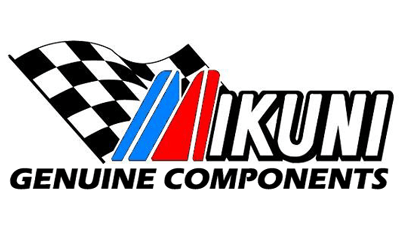 Mikuni carburetors, and components often do not come in Mikuni branded packaging. That being said, you cannot rely on the box the product arrived in. If its a carburetor in question, the size, and actual carburetor model/series number should be on the body somewhere. It can be faint, so look well. Another good way to determine if the carburetor is worthy of the Mikuni name, would be the components inside. Most aftermarket Mikuni carburetors will need to be slightly disassembled to be installed, so while you have the cap off, check the throttle slide and needle. 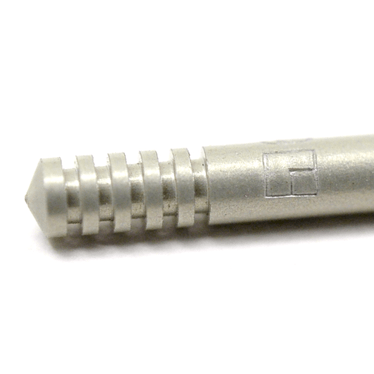 All tuning components manufactured by Mikuni will have the famous "square within a square" tooled into the part. We have done our best to display an example to the left. What if I purchased a knock off Mikuni carburetor? There isn't much you can do about it now, but there are some things you should know. It may claim to be a certain series, or type of carb, and it may look very close to an authentic part. Then you go buy some jets to get it dialed in. Wait a minute! This carburetor is supposed to accept VM4/042 hex style main jets, whats going on? We have seen that some of the copies do not use the same style tuning components as the genuine stuff. We have also seen the jetting rated differently. What would be equal to a 150 main, may have 67.5 stamped on it. This is going to make it real tough to figure out your starting point. You basically will have to start from scratch. 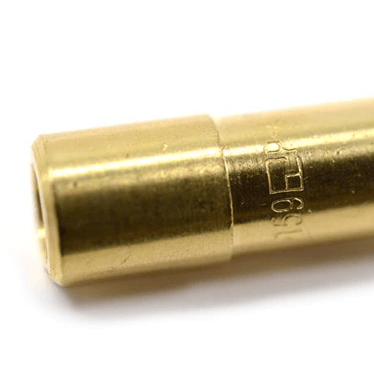 What could possibly be the actual real world difference in tuning components? Sometimes not much. It's the sometimes that causes problems. The quality control at Mikuni is impeccable. You can be sure that every 250 main, 6DH3 needle, or P4 needle jet is going to be the same. You can be sure that when you go from a certain size jet, to another size, that its not going to give you the same, or a reverse effect. Taking a carb off, popping it open, swapping jets can take a good amount of time. Is it really worth the risk? We don't think so. But what about the savings? Jetting can really add up! We can't speculate what you stand to save buying third party vs. genuine Mikuni, but we highly doubt its significant. Most of the jetting that we have seen advertised as manufactured by another company is very closely priced. Sometimes its even more expensive. You are gambling with your time, and frustration. Aside from the stuff honestly advertised as thrid party, some sellers are not so straight forward. Because of this, we wanted to do what we can to educate a little. Off to the right is another example of the tooling marks of a real Mikuni product. If this information isnt adequate, and you are still unsure, let us know. We have had our hands on quite a bit of stuff, and we can help you figure it out. Would You Buy A Motorcycle Designed By Keanu Reeves?